In this last but one episode, Clara phones Danny to try and explain something to him but her mind is seemingly random and confused. She even has post it notes everywhere to try and help her. As she is explaining to him about something she is trying to remember, a woman takes over the call to say Danny Pink is dead. Soon after the Doctor calls and it is he who she turns against in her grief. She kidnaps him by way of persuading him to take her to a volcano where she threatens to destroy all his Tardis keys if he doesn’t take her back to save him, but he in turn tricks her back and agrees to help her even after her distrust and betrayal. He agrees to take her to where the dead go to much to her surprise. Meanwhile, Danny awakes in the Nethersphere suddenly realising he is dead and in a city full of them. The Doctor and Clara land in a place called 3W, a mausoleum, aka the Promised Land/Netherspere and are greeted by Missy who kisses the Doctor much to his surprise. 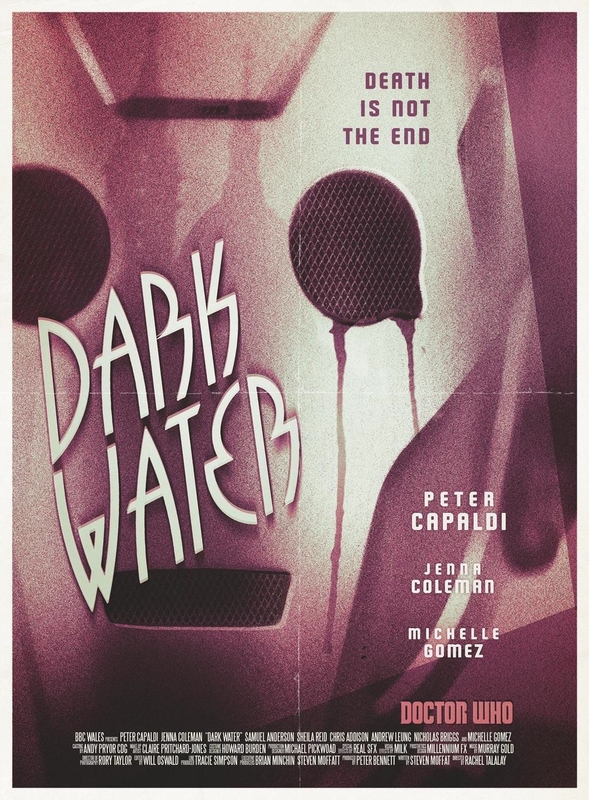 A symbol is everywhere that resembles the tear of a Cyberman and bodies are in watery cases, some of which are skeletons that are alive in Dark Water. And then they meet a Doctor Chang who explains things to them, about what their company is and why the dead are there. He plays to them white noise, voices lost in transmissions and a terrible truth no-one wants to hear. Danny is coming to terms with his past as a soldier and someone from those days as he suddenly has contact with Clara. The Doctor knows something is wrong as he finds the skeletons coming to life and are really Cybermen and Missy created them using Timelord technology. 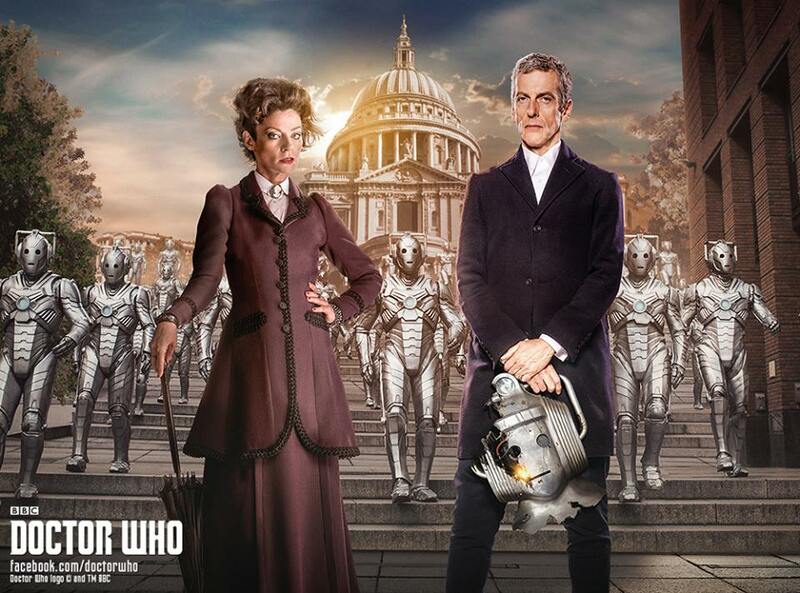 She reveals herself to a shocked Doctor and suddenly finds himself outside St Paul’s Cathedral and the Cybermen are marching yet he is still confused to her identity until she tells him who she is. Now I’m not too happy with the revelation but had an idea it was coming sooner or later; I hoped long after I left this earth. In effect a main character has been killed off and been reinvented but cannot be called by that name any more because of the huge change made. This was done to anger the hard-core fans I think and just because they can as writers. I think in doing so they are testing our loyalty to a long established character who we have all cherished in our hearts. Their thinking has long been obvious going back to Tennant’s era and was criticised back then when the thought was put out there of such a move. Steven Moffat himself left Twitter because of the backlash he took from just asking a question about it so doing what he has done with another character just to test the water is a very risky and bad move indeed. If he had not have done it then someone else would have eventually. My philosophy is if it ain’t broke then don’t fix it. There simply was no need to make that kind of change. There never was and that’s the arrogance of the writers and producer’s in letting it be written. There was much more they could have done if they could have only used their imaginations by creating another character or bringing back an obscure one but instead they have bowed to pressure and the PC brigade no doubt and gone against those that have been loyal to it since children whereas today’s kids will not notice much difference; it will be highly noticeable if the same treatment happens to our time travelling hero. Whilst the episode was good and all the actor’s played their parts brilliantly, I think many will think like me and may tune out next season or the one after, but I will still watch next weeks finale to see how it plays out. Time for a new head writer methinks for Moffet has had his glory and is letting himself get carried away. Sorry Steven, I have loved what you have done with the series and especially this incarnation of the Doctor, but not the way in which you are obviously wanting it to go. Still, the whole thing could be a huge red herring as is speculated just to see our reaction and could change by next week or the next series? I only hope for their sakes that they do leave things be in this respect and start to use their imaginations once more. Their are plenty of strong female leads to use and create spin-offs with without changing main characters just for the hell of it. Hell, if they are that stuck for fresh ideas then they are more than welcome to call on me for a few for I have written down over eighty ideas down which includes two spin-offs and enough for three series worth or more of Doctor Who itself; all of which are original I hope.